Gov. 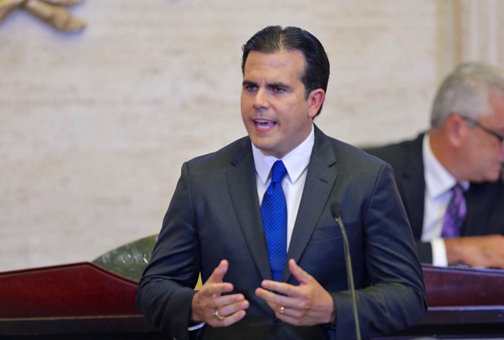 Ricardo Rosselló announced the creation of the third and final sub-working group as part of the Front for Puerto Rico to address the federal tax reform and how these changes may affect the Island, La Fortaleza announced. “It’s important to go with one voice to Congress to insert ourselves into the discussion of federal tax reform and ensure that Puerto Rico can be competitive in the face of the proposed changes,” Rosselló said. On Aug. 29, the three sub-working groups: health, economic development and tax reform, will gather at the Puerto Rico Convention Center to discuss details of the proposals to be adopted by the Front for Puerto Rico by subject area. After the first meeting of the Front for Puerto Rico, several organizations and individuals have indicated their interest in joining the group’s efforts, namely Joaquín Vargas of the IPAs Association and Annette González, president of the Puerto Rico Public Servants. Members of the subgroup to address the impact the federal tax reform would have on the island are: Treasury Secretary Raúl Maldonado; Businessman Manuel Cidre; Attorney Alexandra Lúgaro; Rep. Rafael (Tatito) Hernández, spokesman for the Popular Democratic Party in the House of Representatives; José Caraballo-Cueto, president of the Puerto Rico Economists Association; and Businessman Nicholas Prouty. Meanwhile, Alejandro Torres-Rivera, president of the Bar Association; Attorney Héctor Ramos, president of the Attorneys Association; Attorney Alicia Lamboy, president of the Puerto Rico Chamber of Commerce; Iván Báez, president of the Retail Trade Association; and Lucy Crespo, CEO of the Puerto Rico Science and Technology Research Trust, make up the sub-working group on federal tax reform. Other subgroup members include: Mildred Santiago, executive director of the Cooperatives League; Nelson Ramírez-Rivera, president of the United Retailers Association ; Ramón Leal, president of the Puerto Rico Restaurants Association; Ramón Ponte, president of the Certified Public Accountants; Ricardo García, president of the United Group of Automobile Importers; Ricky Castro, president of the Puerto Rico Chamber of Food Marketing, Industry and Distribution (known as MIDA by its Spanish acronym); Rodrigo Masses, president of the Puerto Rico Manufacturers Association; Silvio López of the Mortgage Bankers Association; and Zoimé Álvarez, executive director of the Puerto Rico Bankers Association. The Front of Puerto Rico brings together various political, religious, labor, business, civic and third sectors to advocate in Washington, D.C. for the island’s inclusion in the consideration and discussion in Congress and the White House on health, economic development and federal tax reform. The Commonwealth’s former governors will be “ex officio” members of the Front for Puerto Rico, so they may belong to the sub-working groups of their choice. The heads of the Puerto Rico House and Senate Carlos (Johnny) Méndez and Thomas Rivera-Schatz will also also be “ex officio” members, as well as Resident Commissioner Jenniffer González, Carlos Mercader, head of the Puerto Rico Federal Affairs Administration, Secretary of State Luis Rivera-Marín, Secretary of State William Villafañe, Secretary of the Interior, Itza García, deputy Secretary of State; Ramón Rosario Cortés, Secretary of Public Policy and Public Affairs, and Julia Keleher, Secretary of Education. Finally, representing the academic sector are Darrel Hillman interim president of the University of Puerto Rico, who will participate in the economic development subgroup, and José F. Méndez chairman of the Ana G. Méndez University System, who will sit in on the federal tax reform subgroup. Hey Buddy!, I found this information for you: "Rosselló creates last subgroup in ‘Front for Puerto Rico’". Here is the website link: https://newsismybusiness.com/rossello-creates-subgroup/. Thank you.